Last fall we announced we’re serious about creating a new Sam’s Club, with a strong membership proposition and a simplified offer from top to bottom. Our focus has always been to provide irresistible value, amazing items, real convenience and simple choices to our members every day, and today we’re taking that a step further. I’m excited to share several changes to our membership and eCommerce strategy. Starting today, we’re adding value to our Plus membership with free shipping. Our Plus members will now receive free shipping on most of the items we sell online, including nearly every Member’s Mark item – with no minimum purchase. We work hard to curate the best assortment for our members, and we’re excited to now offer the majority of these items for free shipping. And, of course, Plus members will continue to receive other benefits they enjoy today such as Cash Rewards, early shopping hours, and pharmacy and optical discounts. 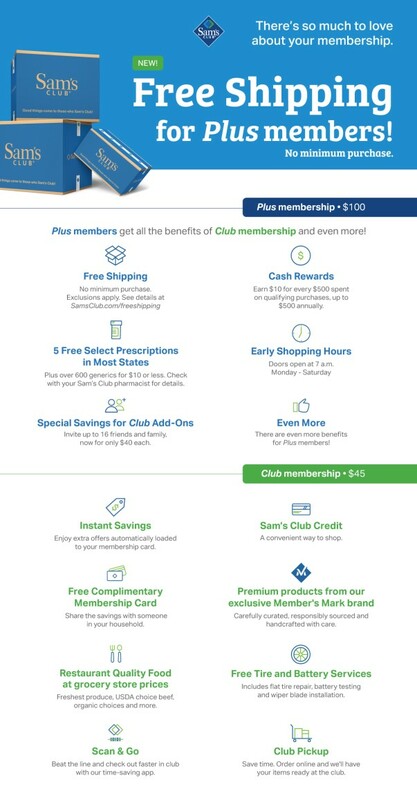 Not only are we adding more benefits to our memberships, we’re also simplifying our membership structure by reducing the number of membership types to two levels: Club for $45 a year (formerly Sam’s Savings) and Plus for $100, which are the lowest membership fees in the warehouse channel. And we are lowering the membership for additional Club memberships to $40. We know the gift of membership is a benefit our members with small businesses love, and we’re happy to help them offer value to their employees. We recently announced our first eCommerce fulfillment center will be in Memphis, Tennessee – and expect to ship our first package early this Spring. Our Memphis center will teach us a lot as we build out this new eCommerce supply chain. We plan to accelerate growth of this network in the back-half of the year. Other regions being considered for fulfillment centers include Texas, Central Florida, the Mid-Atlantic, Southern California, Chicagoland and the Northeast. We are focused on creating the quickest and most convenient shopping experience. Whether members are shopping with us in-club, online or a combination of the two – we’re making it faster and easier. Our members already tell us how much they love Scan & Go and Club Pickup, but we’re not stopping and will have more to share soon! We’re serious about building a new Sam’s Club, and we’re just getting started. Members can expect more from us and we’re excited to exceed their every expectation. This is an exciting time to be in the club and we hope you’ll join us! Sam’s Club launches bulkcoin - the crypto currency that puts large in charge!